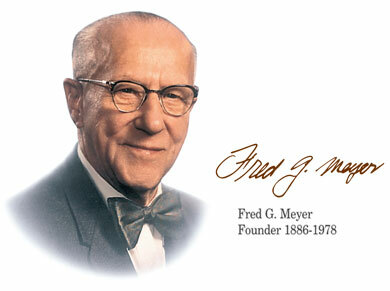 In 1922, Mr. Meyer opened the first Fred Meyer store in Portland at the corner of SW 5th & Yamhill. Mr. Meyer's vision was to give Customers more reasons to shop in his store than in any other. Before he opened his new store, Customers went to separate shops for meat, produce, cheese and other goods. Mr. Meyer placed these all and put an expert in charge of each area, setting the stage for the Fred Meyer stores we know today - stores that average 150,000 square feet and carry more than 225,000 items. Mr. Meyer's ideas still appeal to Customers because our service, selection, quality and prices still save people time and money. With food, health & beauty care, clothes, home products, electronics and more, you can get more shopping done in one stop than at any other store.